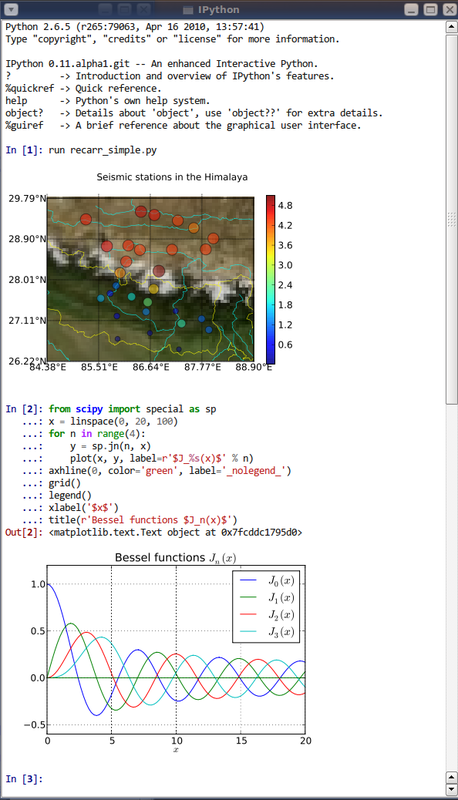 Standalone Qt console: a new rich console has been added to IPython, started with ipython qtconsole. In this application we have tried to retain the feel of a terminal for fast and efficient workflows, while adding many features that a line-oriented terminal simply can not support, such as inline figures, full multiline editing with syntax highlighting, graphical tooltips for function calls and much more. This development was sponsored by Enthought Inc.. See below for details. New model for GUI/plotting support in the terminal. Now instead of the various -Xthread flags we had before, GUI support is provided without the use of any threads, by directly integrating GUI event loops with Python’s PyOS_InputHook API. A new command-line flag --gui controls GUI support, and it can also be enabled after IPython startup via the new %gui magic. This requires some changes if you want to execute GUI-using scripts inside IPython, see the GUI support section for more details. New profile model. Profiles are now directories that contain all relevant information for that session, and thus better isolate IPython use-cases. Pasting of code with prompts. IPython now intelligently strips out input prompts , be they plain Python ones (>>> and ...) or IPython ones (In [N]: and ...:). More details here. See the Jupyter Qt Console site for a detailed description of the console’s features and use. Created a configuration system (traitlets.config.configurable) that is based on traitlets. Configurables are arranged into a runtime containment tree (not inheritance) that i) automatically propagates configuration information and ii) allows singletons to discover each other in a loosely coupled manner. In the future all parts of IPython will be subclasses of Configurable. All IPython developers should become familiar with the config system. Created new configuration loaders in traitlets.config.loader. These loaders provide a unified loading interface for all configuration information including command line arguments and configuration files. 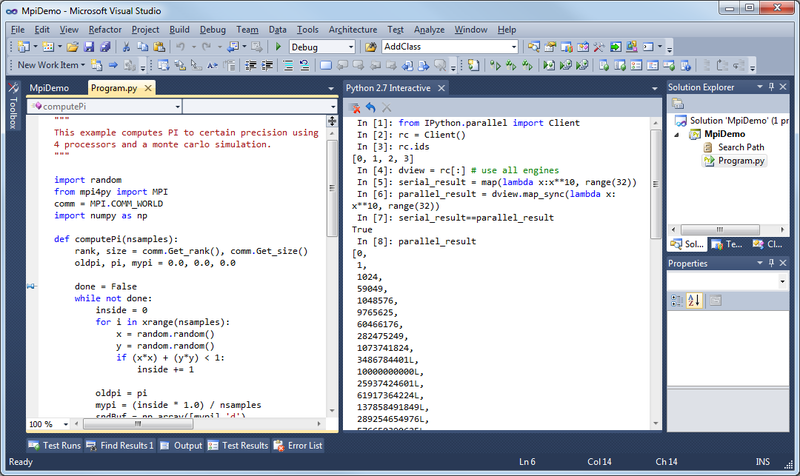 We have two default implementations based on argparse and plain python files. These are used to implement the new configuration system. Created a Traits like implementation in traitlets. This is a pure Python, lightweight version of a library that is similar to Enthought’s Traits project, but has no dependencies on Enthought’s code. We are using this for validation, defaults and notification in our new component system. Although it is not 100% API compatible with Enthought’s Traits, we plan on moving in this direction so that eventually our implementation could be replaced by a (yet to exist) pure Python version of Enthought Traits. Added a new module IPython.lib.inputhook to manage the integration with GUI event loops using PyOS_InputHook. See the docstrings in this module or the main IPython docs for details. For developers IPython.lib.inputhook provides a simple interface for managing the event loops in their interactive GUI applications. Examples can be found in our examples/lib directory. New top-level sub-packages have been created: IPython.core, IPython.lib, IPython.utils, IPython.deathrow, IPython.quarantine. All existing top-level modules have been moved to appropriate sub-packages. All internal import statements have been updated and tests have been added. The build system (setup.py and friends) have been updated. See The IPython API for details of these new sub-packages. Extensions has been moved to extensions and all existing extensions have been moved to either IPython.quarantine or IPython.deathrow. IPython.quarantine contains modules that we plan on keeping but that need to be updated. IPython.deathrow contains modules that are either dead or that should be maintained as third party libraries. We do our best to improve IPython, but there are some known regressions in 0.11 relative to 0.10.2. First of all, there are features that have yet to be ported to the new APIs, and in order to ensure that all of the installed code runs for our users, we have moved them to two separate directories in the source distribution, quarantine and deathrow. Finally, we have some other miscellaneous regressions that we hope to fix as soon as possible. We now describe all of these in more detail. As part of the updating of IPython, we have removed a few features for the purposes of cleaning up the codebase and interfaces. These removals are permanent, but for any item listed below, equivalent functionality is available.